We recently awarded Workspace Community Fund grants to a number of community projects in the Monaghan area where our training and employability organisation, Network Personnel, has two offices (Monaghan town and Carrickmacross). 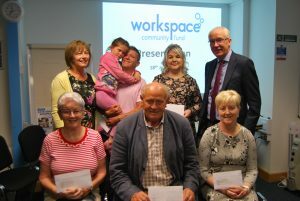 Workspace Community Fund grants were offered to six community and voluntary groups that offer a range of support to local people: Workhouse Carrickmacross; Save Our Sons And Daughters (SOSAD) Carrickmacross; Tearmann Domestic Abuse Service; Dochas for Women; Failte Isteach; and, the Traveller Support Group. The Workspace business model sees us operate commercial businesses which generate surpluses, part of which are used to fund projects in our local area such as our local recreation centre and After School Club. We also provide support directly to local community or voluntary groups to enable projects that otherwise just wouldn’t happen through our Workspace Community Fund. This reflects what Workspace is about since it was founded – helping the local community in a practical way. We are delighted to be able to offer this support to community and voluntary groups in areas where we have offices such as Monaghan and look forward to hearing how our support has helped local people.